An historical dish - Leiden Stew. In the first precarious phase of the 80-year war of independence against Spain, the city of Leiden was under siege for about a year (1573-1574). One third of the population died of starvation and disease. Finally, after the Dutch had breached the dikes and flooded the land, the enemy sneakily withdrew during the night. The story says that the next morning, a hungry boy went scouting and found a cooking pot with still hot stew in an abandoned enemy position. He hurried back with the good news and ... the stew. The same day ships arrived with more food supplies for the starved population. 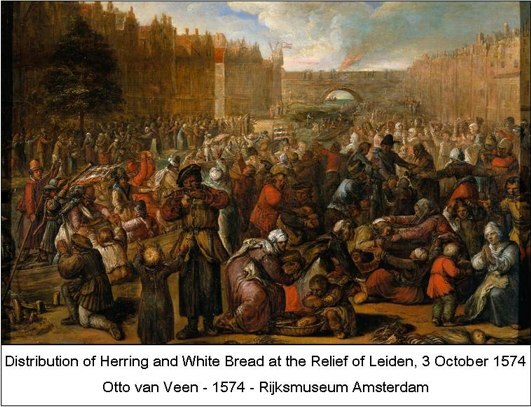 To commemorate, every 3rd of October, this stew is prepared by the people of Leiden. For 4 servings, you need : 250 gr (= ½ pound) white beans, 500 gr parsnip, 750 gr carrots, 500 gr onions, 250 gr (smoked) bacon in dices, 250 gr beef stew meat, vinegar or whole grain mustard, bay leaf, salt, pepper. Parsnip can be replaced by potatoes ; in Europe, the potato was not on the menu yet in 1574. Consider that people in those days had limited fuel supplies for the open fire, and generally just one cooking pot. So soup, porridge and stews were common food. And bread of course, but the homemade dough was mostly carried to a nearby bakery. Preparation : if you use dried beans, put them a night in water. Boil the beans, bacon and beef with bay leaf for a couple of hours on a small fire, in not too much water. Cut the beef in chunks, and add with all other vegetables (also in chunks). Cook slowly and stir now and then (not mashing), for at least 45 minutes. Add salt, pepper and a bit of vinegar/mustard to your taste. If necessary, drain the mix and serve. A slice of wholegrain or rye bread comes nicely with this stew. More on the city of Leiden and its history, see page Leiden. If you would like to prepare Leiden stew (or another traditional Dutch recipe), have a look on page cooking.